It took a friend and I about 20 person-hours of work to scrub down the house with hard bristled brushes, then apply another layer of stain to it. It was all pretty easy work to do, except for standing 15ft above ground on a ladder while doing it. This project likely would have cost $2-4K if I hired a company. Doing it myself, it cost about $400 for materials and labor. These before and after pictures don't really show the color change well, but in real life, it makes the ADU look brand new again. In the past, I've been short on time and would have hired someone. But, as of this week, I'm fully self-employed. I'll now be working through my own companies, Accessory Dwelling Strategies and Caravan- The Tiny House Hotel. Being self-employed hadn't necessarily been a life goal for me, but it's very exciting to have the breathing room to experiment professionally on my own. My time is now my own to use, so I'm now able to save money on home maintenance projects by doing some of my own labor-intensive home projects, like I did with the re-staining. Next, I'm going to work on landscaping. Being self-employed seems a bit tangential to ADUs, but it's not. The passive income that my property generates is what enables me to be self-employed. My 15-year mortgage is covered by the income from the main house. Furthermore, the ADU has now entirely paid for itself via the additional income received above and beyond the costs of the monthly property mortgage. The costs of housing, which are typically an American's largest expense and burden...are for me, a not an expense at all, but a actually a reliable source of income, solely because of the ADU. Being free of a housing expenses might not lead to "riches", but importantly, financial freedom from a ongoing financial burden can lead to a degree of intellectual freedom. This mental and emotional freedom from the burden of housing debt, has historic and celebrated roots in Thoreau's writings, and is an intrinsic ethos that helps drive recent fervor for tiny houses on wheels- a growing, grassroots, counter-cultural American movement in the making. As a result of building and living in the ADU, I'm afforded the chance to add societal value by pursuing my own professional passions instead of working to complete someone else's duties or business obligations. ADUs can be a form of financial permaculture. If housing costs can be financially regenerative such as they are with ADUs, it affords homeowners the time and energy to do things that are most important to them-- to engage more in the community, make art, volunteer, create new jobs, etc. 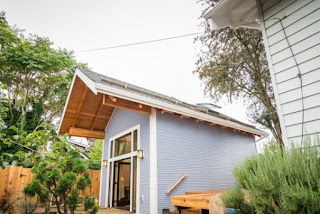 It strikes me that of hundreds of ADU owners I've met, no one expresses any regret about having built an ADU, and most strongly encourage others to do it for some of the same financial reasons that I have described. I'll be speaking about ADU development at one of my favorite local non-profits, Northeast Portland Tool Library. It's a free one-hour talk at their tool library, so come check it out. A half-day ADU class for realtors: All About ADUs - A Primer Course for Brokers, held at Earth Advantage. This first session is intended to help individuals figure out what kind of small housing (tiny houses on wheels, cluster communities, and ADUs) works best for individuals by looking at the pros and cons of the legal, financial, and design/build processes involved in each small housing form. Dee Williams of PAD Tiny Houses and Eli Spevak of Orange Splot and I will helping to tease out the the respective differences between tiny houses on wheels, cluster communities, and ADUs, respectively. Respectively, we're dwellers in, and experts of, the types of housing that we'll be covering. My 2nd session will be a dive into the zoning regulations, costs, and financing that govern ADU development for homeowners. I'll be presenting with Vince Kingston of Eagle Home Mortgage, who will discuss ADU financing methods using cash-out refinancing, rehab mortgages, and home equity lines of credit. City-wide ADU Tour. This fall ADU tour will include 11 beautiful ADUs across Portland that have never featured been a tour. Early bird sales end on October 24th. Special 6-hour ADU class for homeowners. This class will be held at the Kennedy School and is only intended for ADU Tour attendees. I think most people would agree with your awesome article which is specially related of new construction. I am going to bookmark this web site so I can come back and read more articles. Keep up the good work! Very informative article which is about the concrete contractors and i must bookmark it, keep posting interesting articles. I really appreciate your work and very amazing and important information about the apartments which have share in this blog. I visited your blog for the first time and just been your fan and get many informative information about the landscapingI Will be back often to check up on new stuff you post wll done. Best Home addition company Toronto, Asasa Constructions is the best home addition and renovation contractors for residential and Commercial in GTA.ASASA Construction offer service are new home addition,demolition services,bathroom renovation,basement design and finish,windows and doors,hardwood floor and laminationetc. Your all information about the home related all information are very helpful for me well done.